The Sudan Flag features three horizontal bands in the colors of red, white, and black. 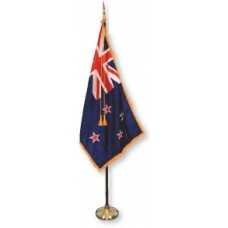 On the left-hand side of the flag is a green triangle, pointing towards the center of the flag. The Sudan Flag is based on the Arab Liberation Flag and the colors used are the pan-arab colors. The colors together, represent the Arab unity and independence. 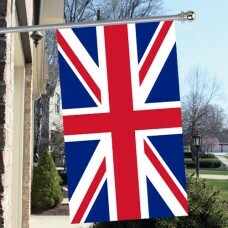 The red color represents the struggle and battles fought for independence and the sacrifices that the people have had to make for their country. The white color represents peace, light, and optimism as well as the "White Flag League" who were the nationalists that opposed colonial rule in 1924 and the black color represents Sudan because in Arabic, Sudan translates as black. The black color of the flag also represents the nationalists who opposed colonial rule during the "Madhist Revolution." 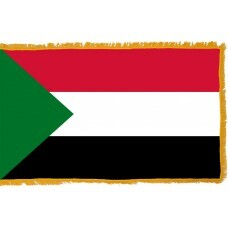 The green color of the Sudan flag represents Islam, and the rich agriculture and hope of the land. The Sudan Flag was adopted on May 20th, 1970. Sudan (also now known as North Sudan) is a country in Africa that shares borders with Egypt, Red sea, Eritrea, Ethiopia, South Sudan, Central African Republic, Chad, and Libya. Sudan used to be the largest country in Africa until July 9th, 2011, when the Southern part left the country and was made into a separate country. It is now the third largest country in Africa. The capital and largest city of Sudan is called Khartoum. Khartoum is located where the Blue Nile and the White Nile merge. In 1874, Egypt conquered Sudan and in 1882, following the British occupation of Egypt, the British took over Sudan in 1898. From 1898-1955, it was known as the Anglo-Egyptian Sudan. In 1953, Sudan was granted self-government by Egypt and Great Britain and was granted and gained full independence on January 1st, 1956. Following Sudan's independence, however, there has been a lot of conflict and wars between the North and the South, mainly due to religious differences. Sudan has been ruled by unstable governments and militaries since 1956 and the conflict between the Muslims of the North and the Christians of the South resulted in Africa's longest civil war between 1955-1972, where more than 2.5 million people lost their lives and approximately 4 million people "displaced." Sudan is considered to be one of the poorest countries in the world. The economy, today, is mainly reliant on agriculture. As Sudan is one of the larger Arab states, tourism does contribute slightly to the economy. Due to the civil wars, the tourism industry heavily declined. The main tourist attraction in Sudan are the "Pyramids of Meroe." There is a collection of over 200 ancient pyramids here, the majority of them being tombs for the Kings and Queens that ruled during the "Meroitic Kingdom" which ruled the area for approximately 900 years. We buy glory, at the dearest price. This land is ours, may our Sudan live well known among all nations.